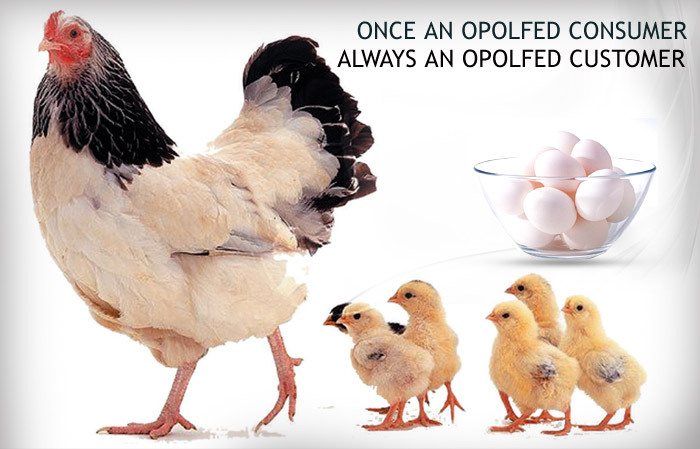 Odisha State Poultry Products Co-operative Marketing Federation Ltd., which is widely known as "OPOLFED", is a state level apex poultry co-operative marketing organisation. OPOLFED was registered as a society on 29.03.1976 with the Registration No.1/1976 and has been declared as an apex co-operative federation on 22.03.1984. Its area of operation extends to whole of the State Odisha. Supply of inputs to poultry farmers. Marketing of eggs, Packet eggs, dressed chicken meat, poultry feed etc. Supply of poultry products to consumers at reasonable rate. Supply of eggs to school children in different districts of the state under MDM programme. Self-employment opportunity for the educated-unemployed youths. Implementation of Odisha Women Poultry Project (OWPP) in Khurda & Angul districts. VAT exemption on eggs, meat, poultry feed. Single window system for poultry development.